We have been getting quite a few calls asking about Brandon. People are feeling out of the loop now that my blogs are not as consistent. Well, I am thrilled to report that there have been few blogs because we have been so busy with "real life"...to life before cancer. Chores, errands, spending time with the kids, going out for dinner, vegging in front of the TV. Brandon has completed round 2 of chemo! It was a lot easier on him than round 1 (thank God). That was probably due to the fact that he did not start this round as sick as he was in December, the chemo was a lot less aggressive, and there was no cancer in his body (so less poison to flush). His numbers are now back in the normal range (they dropped just like round 1), he has gained back 21 pounds (up to a whopping 176) and even his hair is starting to grow back a little. He is feeling wonderful. So great in fact, that today he headed out to Oshawa to join his regular hockey team - and even scored an assist! Unfortunately we are still waiting for that much-needed miracle --- a stem cell donor. It is a frustrating phase as we can only wait and hope that (1) someone is a match, (2) they agree to donate and (3) they follow through with the process. The team at Princess Margaret has been great, but a huge part of it is also out of their hands. So until then, Brandon is scheduled for his next round of chemo to start in the next week. Thanks again to everyone who remains connected and concerned and hopeful. Koby is now 16 months and is truly a "big boy". He has learned to get around everywhere, eat on his own (somewhat) with a spoon or fork, comb his hair, ride his toy horsey (loves it) and communicate what he wants (without speaking). 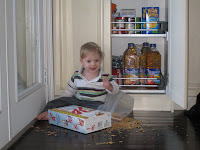 He is also extremely technically savvy - a future engineer - he figures out how things work, takes them apart and puts them back together (e.g., how to open the pantry, rip open the box of cereal, and dump it out for a snack). We are still getting to know him and his wonderful personality - and boy does he have one! In summary - Koby is GOOD. That is the best way to describe it. He will share everything he has (feed you his food), give you big kisses, and do ANYTHING to make you smile or laugh. As soon as he realizes that something has made you smile, he gets shear pleasure out of repeating the process. He also has the best laugh ever! You would think there is an old man in the room - a chuckle right from the gut --- that also brings a smile to everyone around. And so Koby gives daddy happiness medicine - a smile, a laugh, a snuggle. Medicine of the purest form that heals like nothing else. He truly lives his name Ness (miracle).